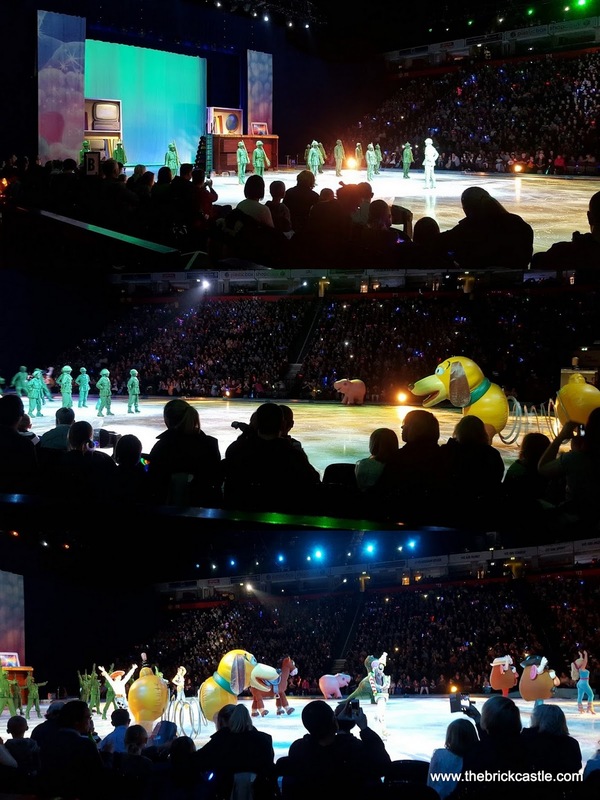 Disney On Ice arrived back at Manchester Arena last night with the World's Of Enchantment Tour, and we were some of the lucky people who had tickets to see it. 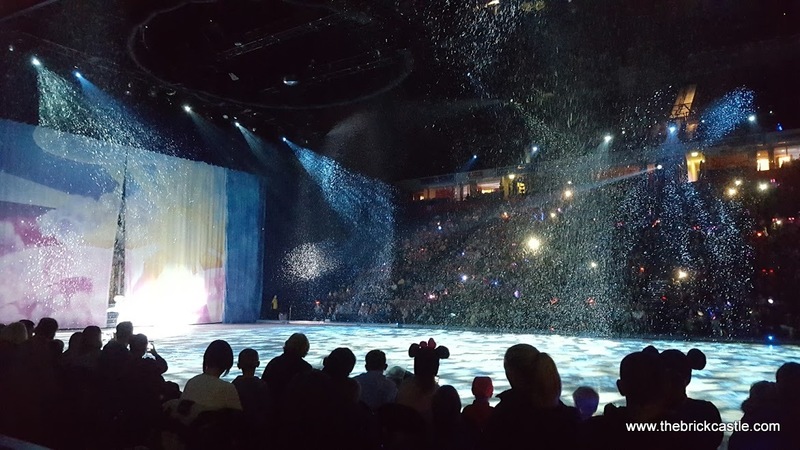 This year the show features Mickey And Minnie and the gang, as well as characters from Toy Story, The Little Mermaid, Cars and brand new for this year - Frozen. The excitement was clear when we arrived - we were very early yet must have spotted Elsa and Ana around 50 times walking from the car to the arena. The boys were already buzzing with excitement and then we got to meet the 2 main stars..
We did have nice seats, Row A, which was actually behind a walkway and 3 rows of seats at the edge of the ice, but I think it was actually so compact and steep that unless someone tall with a hat sat in front of you (or someone lets their child stand on the seat), you'd have a good view. Mickey and Minnie opened the show, followed by Toy Story, with a 40 minute segment retelling the movie. It was great. The characters were spot on. 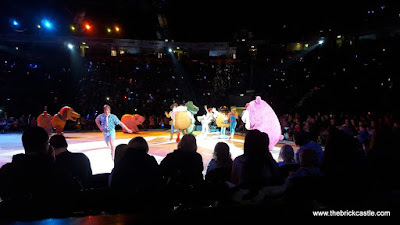 Ken and Barbie's hair was perfect, the changing room scene was hilarious and the larger characters, especially Slinky, Ham and Bullseye are fabulously done. 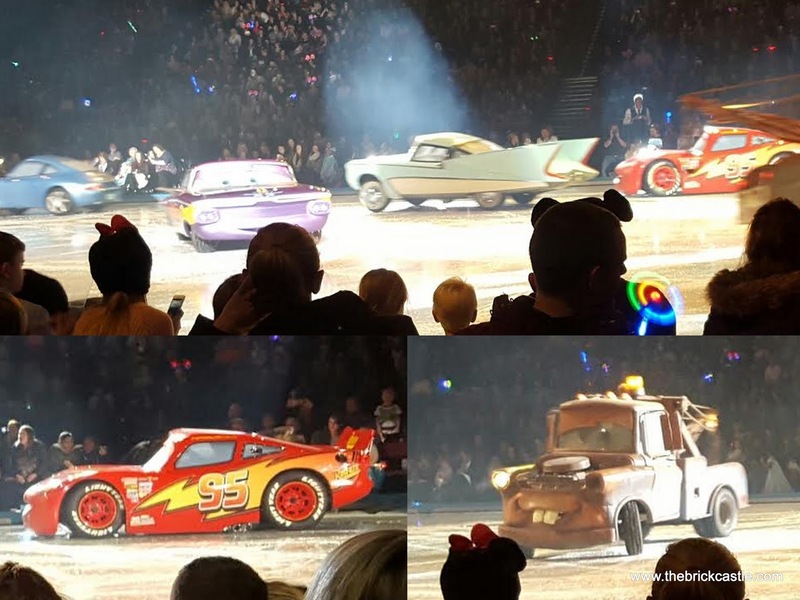 I have no idea how they manage to stay on their feet racing around the ice. 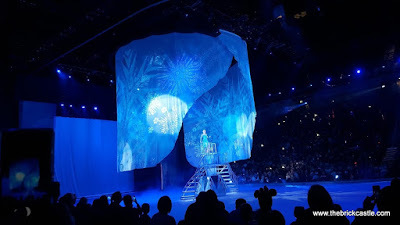 After Toy Story we were treated to Ariel and the rest of the undersea crew in The Little Mermaid, with an extract from the story. 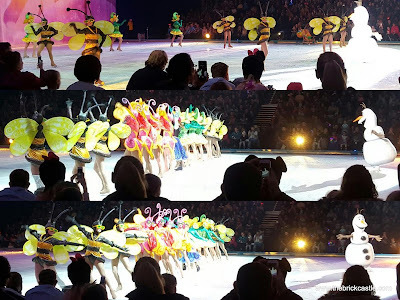 There were lots of group dances in this and the choreography is excellent. Everyone has cast members facing towards them almost all of the time, even when seated the cast don't forget the people behind them. It wasn't our favourite bit of the show, but The Little Mermaid has never been one of the more popular movies in our house. After a short interval, which was plenty long enough for a toilet trip, Mickey and Minnie were back to introduce Cars, with Lightning McQueen, Mater and the rest all sliding around on the ice in such a well-controlled way that as an adult I spent half my time just watching the driving skill. That rink is tiny and those cars are huge! 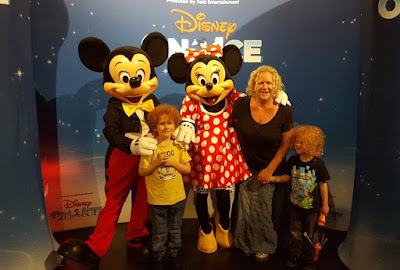 The children were completely enchanted. Every time I looked at them they were looking wide-eyed at the ice. There were lights dotted throughout the crowd and everywhere you looked children holding Disney character toys and dressed as their favourites. You can't deny Disney does have its own magic. Finally the one that a large number of the crowd had been waiting for - Frozen. I might not generally like pink and fluffy, but I can appreciate a good dress, and the costumes and scenery were stunningly beautiful. I didn't really get the bugs dancing bit. 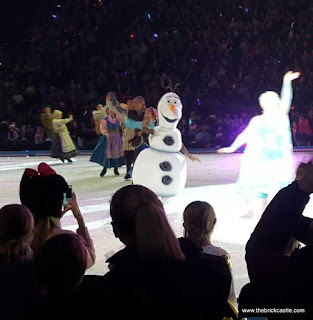 I can appreciate that Olaf was imagining Summer, and it was very skillful, especially wearing the hooped costumes, but I felt it was a bit random and didn't match the movie - despite most of the rest of the show following almost exactly the movie and soundtrack clips. I think it was just me though, everyone else seemed to love it. 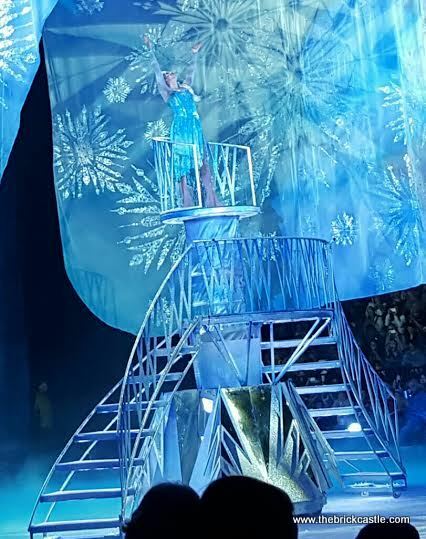 Queen Elsa's frozen world was fit for any Queen. Truly stunning it was incredibly well lit and glistened beautifully. With the addition of the snow, the smoke, the song and the cast, it was a package that came together perfectly to create something magical every child there will remember forever. The skating was almost faultless, and no-one that we saw fell or even slipped out of place. We saw one dancer wobble, but she saved it. 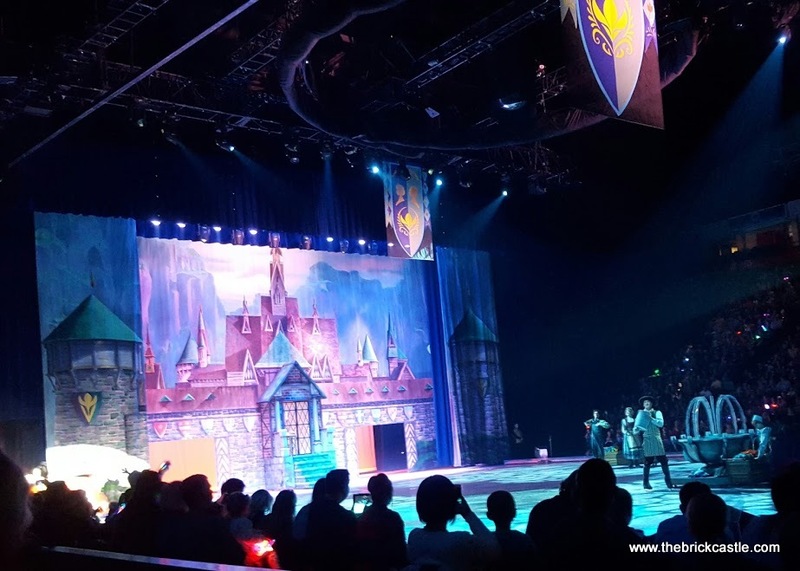 The cast gave their all and were constantly acknowledging the crowd, waving and smiling, always making the extra effort to make a child's evening. 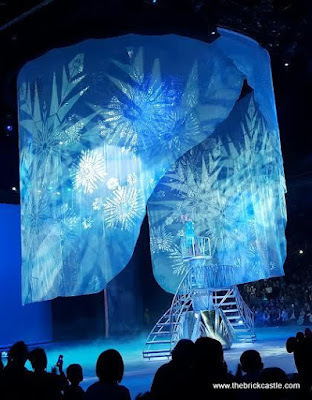 Disney On Ice really fulfills the promise of Disney magic. It delighted all of us from age 5 and 7 to teenager and doubting adults. We all spent half the evening saying 'wow', had an excellent night out and made some lovely memories to last us a lifetime. Disney On Ice World's Of Enchantment Tour will be in Manchester until Sunday 18th October, then it will travel to Birmingham (21st Oct- 1st Nov), Belfast (5th to 8th Nov), Dublin (12th-15th Nov), Sheffield (18th -22nd Nov) and London (22nd Dec - 3rd Jan). Ticket prices vary. We were given our evening out free of charge for review. 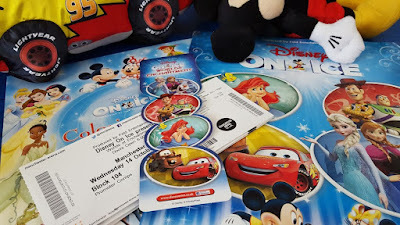 I'm quite a Disney cynic but we absolutely loved it. 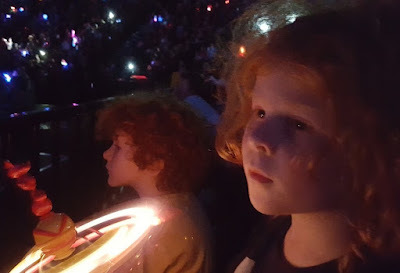 LM was wide eyed with wonder for the whole show and it actually made me a little emotional because she adored it so much. A fab night out. I think you would prefer to have the curtain like that than a house like this. You can get that and place in your bedroom. The show look awesome. I would definitely bring my kids to watch it!